The Tokyo metropolitan government announced that a woman who had a meal at a puffer fish restaurant ‘Fugu Fukuji’ in Ginza, Tokyo complained of lip numbness and a headache, and was temporarily hospitalized. Chuo City health centre came to the conclusion that the woman had food poisoning from puffer fish because she ate the toxic liver. The restaurant is due to have its business suspended and Tokyo metropolitan government is also considering administrative punishment. According to the restaurant, Fugu Fukuji was awarded two stars in ‘The 2011 Michelin Guide to Tokyo, Yokohama, Kamakura’ which evaluates restaurants and hotels. According to the metropolitan government, the woman and a male acquaintance started the meal at about 8pm. She ate ‘Kimo Ponzu’ which uses the liver of the tiger puffer. At about 10.30pm, she complained of food poisoning symptoms and was hospitalized in the healthcare facility in Shibuya city. She was discharged the next morning. ‘Kimo Ponzu’ was not on the restaurant menu. The puffer fish chef reported to the healthcare facility ‘I provided it because the customer asked for it. I have served it to her male acquaintance in the past’. Puffer fish (‘fugu’ in Japanese) is one of the most celebrated but also most notorious of Japanese dishes. Special licences are required to prepare and serve the fish in restaurant, as the toxic parts need to be carefully removed to ensure they do not contaminate the parts of the fish that are eaten. Some consider the liver to be the most delicious part of the puffer fish, but it also the most poisonous and consuming it can result in death. 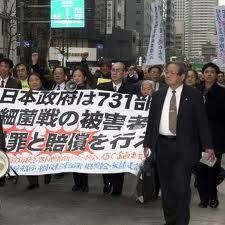 Serving the liver in restaurants was consequently banned in Japan in 1984. 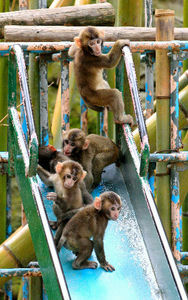 On Mount Takasaki Natural Zoo in Oita City, where wild Japanese macaque monkeys have made their home, the babies born this year can be seen playing vigorously with the ‘jungle gym and slide’ installed specially for them. 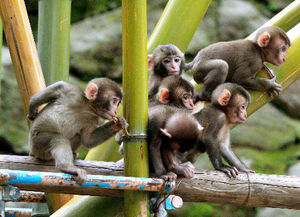 According to the zoo, a total of 94 baby macaques were born to two groups on Mount Takasaki between May and September 2011. 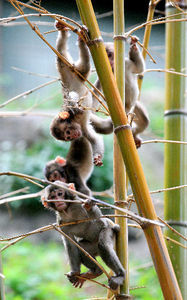 At a month or two old, they are grown up enough to play in groups, and they start to integrate into the macaque society. In the evening, the mothers come to collect their babies and go back to the mountain together. 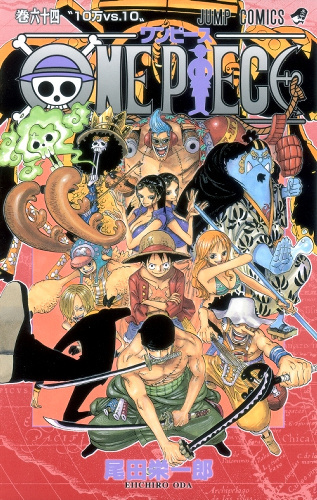 On 4 November 2011, the first-run printing of the 64th volume of ONE PIECE (Shueisha Inc.), a Japanese comic book series by Eiichiro Oda, reached 4,000,000 copies; a Japanese publishing history first. According to Shueisha, the cumulative circulation of the ONE PIECE comic books in Japan is more than 250,000,000. The 64th volume print run surpasses the initial print run of the 57th volume, released in March 2010, which reached 3,000,000 copies. Cumulative sales of Les aventures de Tintin (first published in 1929) are estimated at around 350,000,000, a figure which has already been matched by Akira Toriyama’s DRAGON BALL (first published in 1984). As a relative newcomer, ONE PIECE (first published in 1997) has a phenomenal following in Japan and its latest volume looks set to break all sales records. Never heard of ONE PIECE? Find out more on the Shonen Jump website. On the 19th of October, Mr Mizobata, Commissioner of the Japan Tourism Agency, held a press conference at the tourism trade fair ‘ITB Asia’ as it kicked off in Singapore. He announced a plan to pay for 10,000 foreigners to visit Japan in 2012, to help the recovery of foreign tourism which has dropped significantly in the aftermath of the Great East Japan Earthquake. The Tourism Agency will invite foreign sightseers to share their experiences via the Internet and show the world how safe and secure Japan is. 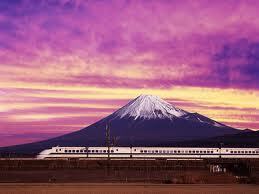 ¥1.2billion (£10 million) for this project has been requested from the 2012 fiscal budget. I’ll be reporting when the Japan Tourism Agency announces how the selection process will take place, so bookmark this blog and check back soon! What do you think about this plan to increase tourism? A great idea or could the money be better spent elsewhere? 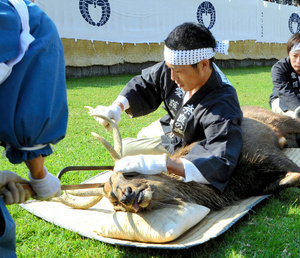 The autumn tradition, ‘Cutting stag horns’ started on the 8th of October in Nara Park, Japan. This is a traditional event handed down from Edo times (late 1600s to early 1800s), to prevent stags from injuring people and other deer during the rutting season. Men wearing traditional ‘happi’ coats drive out the deer and knock down the fleeing stags, before attaching a crucifix-like tool to which helps them to control the animals. Local priests then quickly saw off the stags’ horns. Around Nara Park, famous for its many deer, more than 100 of the animals are hit and killed by cars every year. This year, for the first time, warning signs were displayed for drivers by the ‘Foundation for the Protection of Deer in Nara.’ Cutting of stag horns will resume from 12pm on the 10th of October. Never heard of Nara? A quick guide to one of Japan’s lesser-known cities. 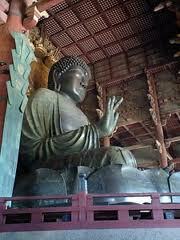 Nara was the capital of Japan from 710 to 794 and is situated in the Kansai region, close to Kyoto and Osaka. Nara Koen (Nara Park) is a public park designated a ‘place of scenic beauty’ where more than 1,200 deer roam freely and enjoy being fed by visitors. According to legend, a mythological god, Takemikazuchi, arrived in Nara on a white deer to guard the newly built capital. For a long time, deer were regarded as heavenly animals, protecting the city. After World War II the deer were officially stripped of their divine status and were instead designated as National Treasures. Nara isn’t just famous for its deer. It has countless temples and shrines, plus the amazing Buddhist temple ‘Todai-ji’, the world’s largest wooden structure housing the world’s largest bronze statue of a Buddha Vairocana, or what the Japanese call ‘Daibutsu’ (Big Buddha). Re-modeling of shops and restaurants will accompany the construction of station concourses and adding of more platforms, with the work planned to finish at the end of next fiscal year. The number of shops, and the concourse size, will be around the same as before the re-modelling, but annual sales forecasts predict a 200,000,000 yen (£1.7 million) increase in takings. Kushikatsu is Japanese-style deep-fried kebab skewers. Kushi refers to the skewers and katsu means a deep-fried cutlet of meat. 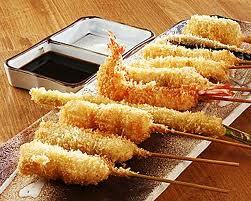 Kushikatsu can be made with chicken, pork, seafood, or vegetables. These are skewered, dipped in egg, flours and bread crumb, then deep-fried. Takoyaki are grilled octopus dumplings. 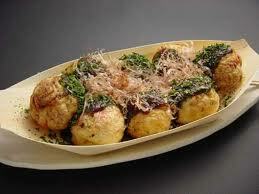 They are made of batter and cooked in a special takoyaki pan. It is typically filled with diced octopus, tempura scraps, pickled ginger and spring onion. Tastier than it sounds! 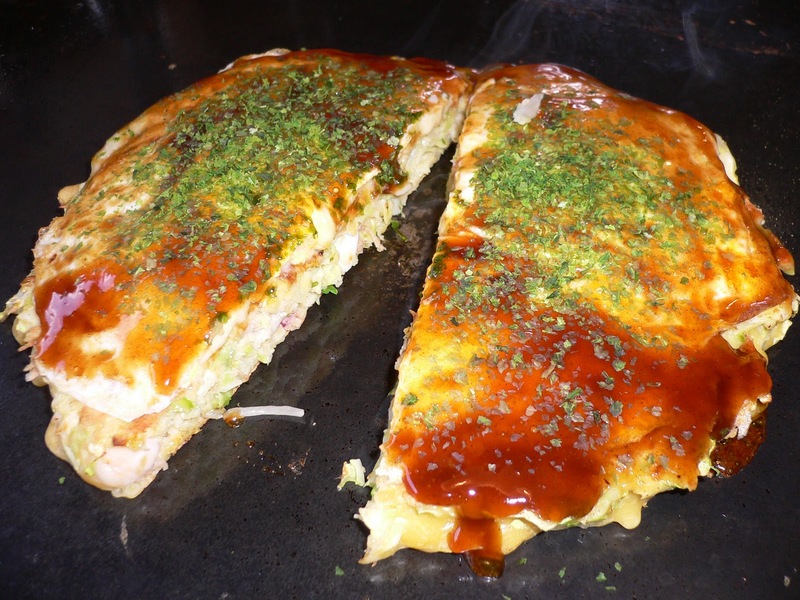 Okonomiyaki is a savoury pancake containing a variety of ingredients, including shredded cabbage, and topped with bacon, shrimp or whatever you choose. 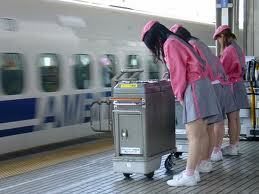 The name is derived from the word okonomi, meaning “what you like” and yaki meaning “grilled”. It is usually cooked on a hot plate at your table. Negiyaki is similar to Okonomiyaki, with the main ingredient being spring onion, rather than cabbage. 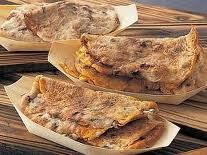 Butaman is made from flour dough and filled with cooked mince pork. 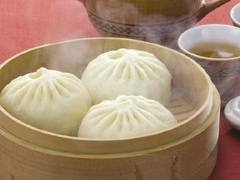 Butaman are steamed and look like giant dumplings. Cheap and delicious! Ikayaki is a squid pancake. 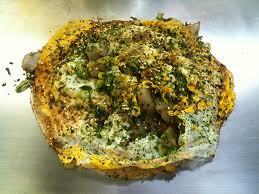 It is prepared much like a folded crepe and includes chopped squid, sauce and sometimes egg. Once cooked it is pressed between two iron plates.